LG Wallpaper TV – LG released a TV as thin as wallpaper. Can you believe it? I sure as hell can’t. What I can tell you is that there is a lot, and I mean a lot to like about the LG’s new OLED TV. It has a super-slim design and is operating on the new webOS 3.5. 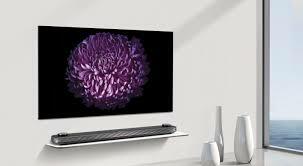 It is a huge sum to pay however the thin frame on top of the Dolby Atmos sound bar on top of 4 types of HDR support on top of a magnetic mounting system on top of the operating system surely is worth the money.